As more and more people starting to enjoy movies at home, DVD and Blu-ray become their first choices. No one can argue that watching DVD and Blu-ray is enjoyable, however, besides just watching movies made by movie studios, some people enjoy making their own DVD and Blu-ray even more, They like to burn movies they downloaded from movie download sites or video clips made by themselves to a optical disc to preserve them. To make a DVD or Blu-ray, people need DVD maker software or Blu-ray maker software to help them. There are a lot of Blu-ray making software on the market. Some of them are free, others are not. But what is the best Blu-ray maker software? What Blu-ray maker software is easy to use and not too expensive to purchase in the same time? Today I want to introduce the best Blu-ray maker software I have ever tried, show you how it works, and the reasons why I like it so much. But first, I would like to start from explaining the differences between DVD and Blu-ray. DVD and Blu-ray are people’s favorite media forms to watch movie at home. Both DVD and Blu-ray are most commonly seen as optical discs. The differences between DVD and Blu-ray mainly lie on the Storage capability and the compatibility of the disc, Laser technology and file structure. DVD- Single layer DVDs can store about 4.7 GB of data, which is about two hours’ worth of movie. Blu-ray- Single layer discs, on the other hand, can store approximately 25 GB of data, this equals about two hours of high definition information or 13 hours of standard definition information. So, as you can see, a Blu-ray disc can store way more data than a DVD disc. Not only the size, the construction of the disc is also different. You can see the difference from a DVD folder structure and a Blu-ray folder structure. As for the laser technology, DVD- DVD players use a red laser at 650nm wave length to read DVD discs, and Blu-ray players, as its name implies, use a blue laser to read the stored information. Blue laser wavelengths are shorter than the red at 405nm and are about two and a half times smaller in diameter than red lasers. What makes a piece of Blu-ray maker software the best piece of Blu-ray maker software? First, the software must be stable, meaning there cannot be too many glitches and bugs in the program. There are many programs that allow you to make Blu-ray disks which are free, but freeware like this is highly likely to have so many bugs and glitches that makes it very hard to complete a Blu-ray making process, or includes so many annoying ads or malwares. The second thing you need to pay attention on, is the quality of the output disc. Some of the programs can keep the original quality of your movie, so that you can have the best visual and sound effect, while others cannot. The third thing you need to care about is how powerful the program is. Some programs only allow you to burn a plain disc with no other functions included, while others can allow you to make Blu-ray menu, edit your video before you burn it to a disc, or even convert 2D movie to a 3D movie. With that being said, there is one program that I want to recommend as one of the best Blu-ray maker software. The program is called Leawo Blu-ray Creator. 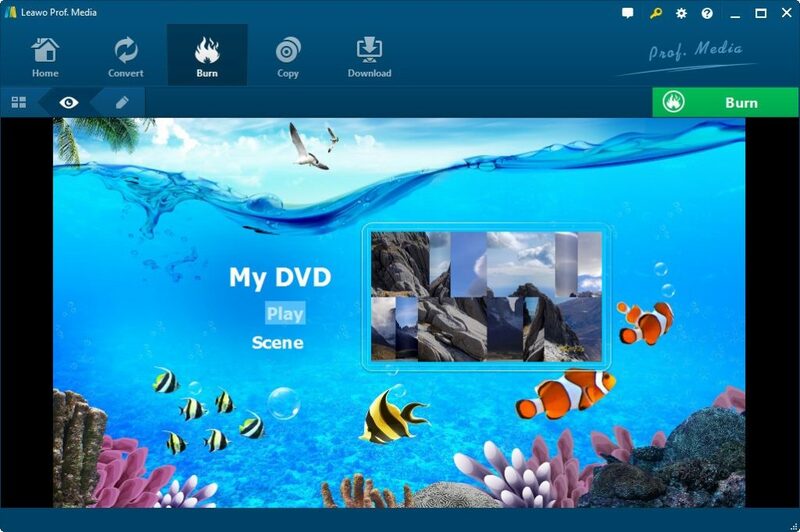 Leawo Blu-ray Creator can meet all the demands mentioned above. First it’s very stable, it’s rare to encounter any bug or gitch while using it. Second, it can retain the original quality in the burning process. Third, you can have a lot of bonus features like editing your video, adding watermarks, adding 3D affects to the movie, and making a Blu-ray menu that works on a Blu-ray player. 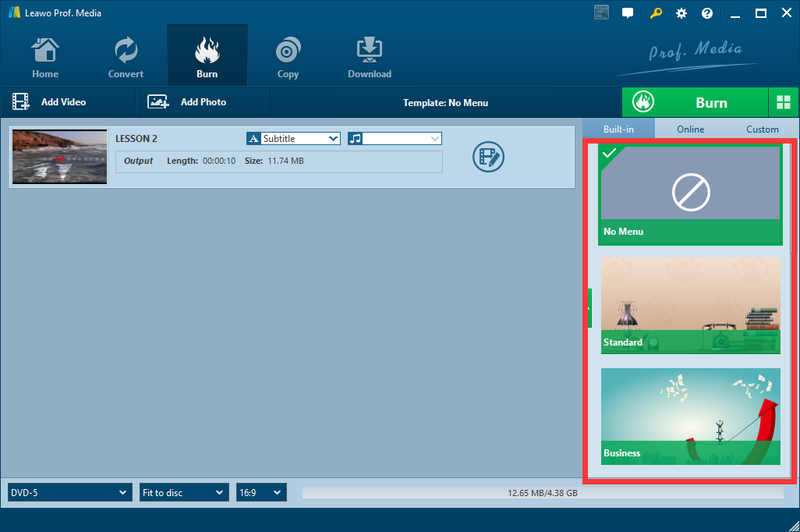 Besides everything mentioned in the last part, another major reason why Leawo Blu-ray Creator is one of the best Blu-ray maker software is that, this program is very easy to use. Anyone can figure out how it works very fast and finish the Blu-ray making process within minutes. Here is how exactly you can make your own Blu-ray disc with Leawo Blu-ray Creator. ☉ Burn videos to Blu-ray/DVD disc, folder ISO file. ☉ Burn ISO image file to Blu-ray/DVD disc. ☉ Edit output videos to add watermark, trim video, adjust effect, etc. ☉ Create 3D Blu-ray/DVD movies with 3D effects. ☉ Design and add disc menu with personal preferrences. 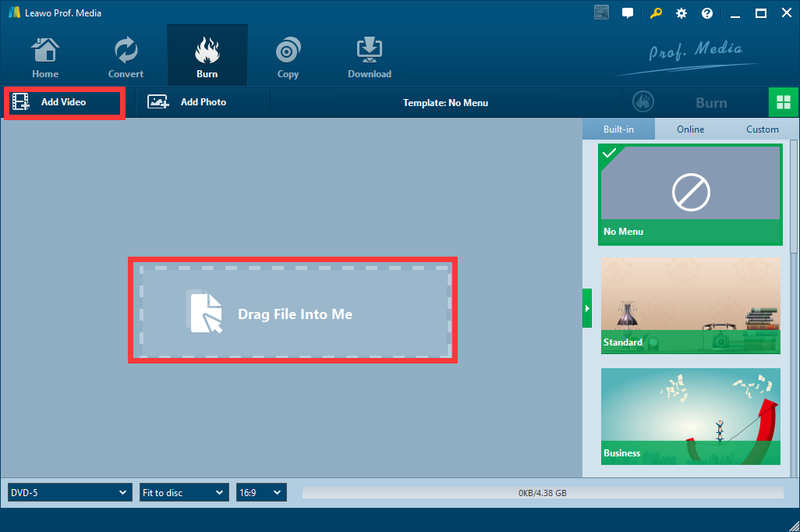 Step 2: Insert a blank Blu-ray disc to your Blu-ray drive, and launch Leawo Blu-ray Creator. Step 3:Import your file by clicking the “Add Video” button or directly drag the file into the frame in the center. Step 4: You can now edit your video by clicking the “edit” button. As mentioned above, you can trim, crop, add watermark, add 3D affects to your video here. Step 5: You can design a Blu-ray menu if you want to. The Blu-ray template zone is on the right. Choose a template and you can preview and edit it. Step 6: Once you have done all the edit and menu designing work, you can click the green “burn” button to choose an output directory and start to burn your Blu-ray. Step 7: The process normally wouldn’t take too long.